My mother and grandmother were incredibly capable women. Both were knitters, my grandmother could crochet and my mother was an experienced seamstress and needlewoman. 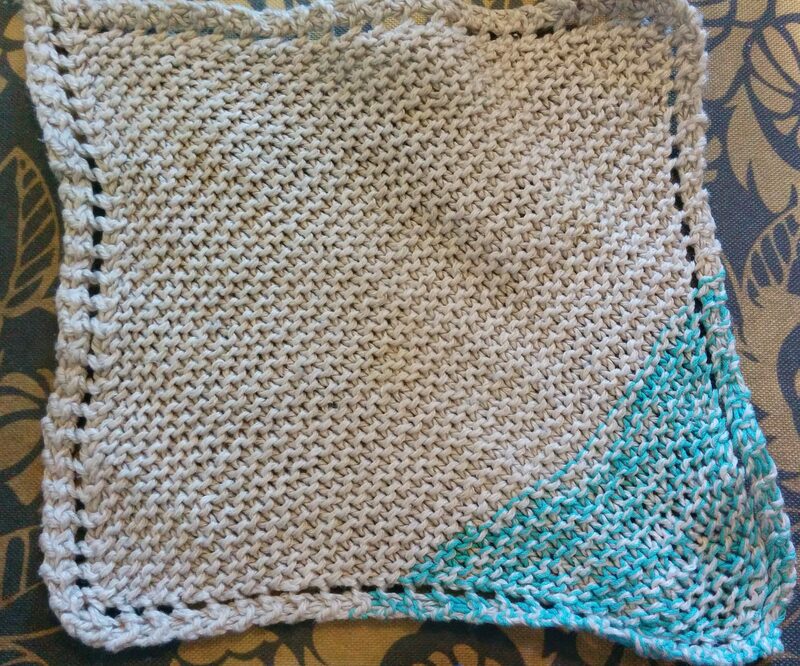 I remember as a very small child helping with edging blankets, learning how to hand embroider, mend and being ever so proud when I learnt to knit and made my first diagonal dishcloth. I don’t knit much these days, apart from the occasional scarf or beanie. But a couple of years ago I decided to ditch plastic dishcloths, which (apart from being bad for the environment) aren’t ideal for fine china and glassware when the cloths get older and brittle. So I made a set of beautiful soft cotton cloths again and branched out to smaller versions in jute string as scourers. The cloths look impressive, they’re very quick to make, incredibly durable (I machine wash mine) and it’s still the best way to learn how to increase and decrease with a decorative eyelet. A set of four or five cloths can also be a functional present. I made a set for a family member who’d recently renovated her kitchen and picked tones that matched her decor. 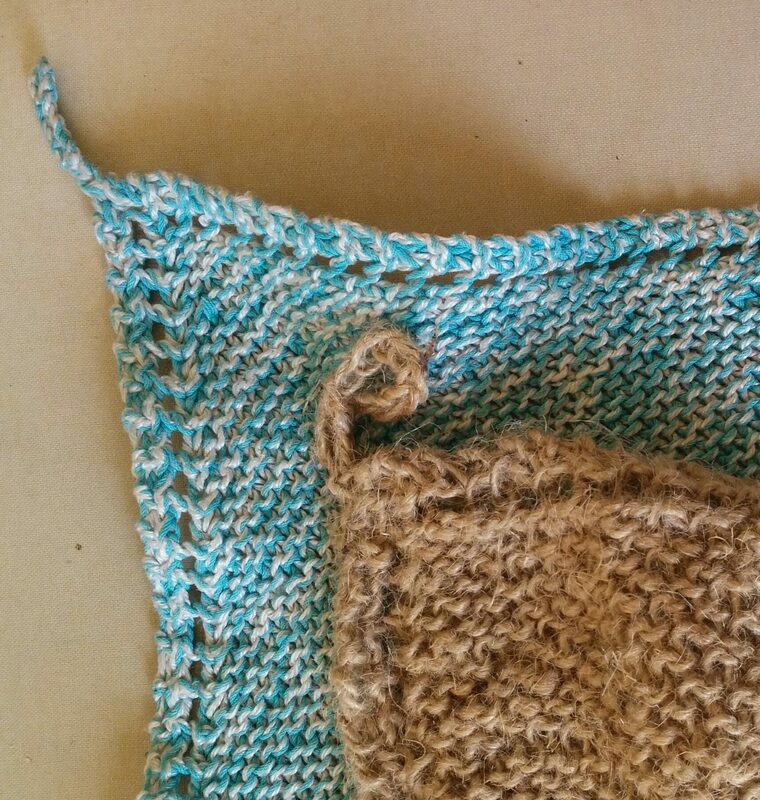 Dishcloth from salvaged yarn – straight from the clothes line! Repeat from * until the work is half the size required. I like about 25-30 stitches for jute scourers and about 55-60 stitches for cotton dishcloths. Repeat until 2 stitches remain. K2tog, and (if you want to hang your cloth) chain 12, cut thread and tie off. With a darning needle, sew the end of the thread into the base of the first chain to make a loop. Over sew a couple of times and trim. Because they’re quick to make and a very simple pattern, I can easily make one cotton cloth in an evening watching television or several jute scourers. I prefer to get my cotton from Op Shops rather than buying new, it goes well with the reuse/recycle ethic I try and live by. I’ve even made some from a cotton top that I unpicked, washed the hanks of thread to take some of the kinks out, and dried in skeins. Many fabric or yarn shops sell string but the best jute I’ve found is in the gardening section of my local hardware store. It’s a little harder on fingers to work the stiff threads but they are brilliant for scouring pots and pans and once they’re worn out they can go straight into the compost instead of landfill.